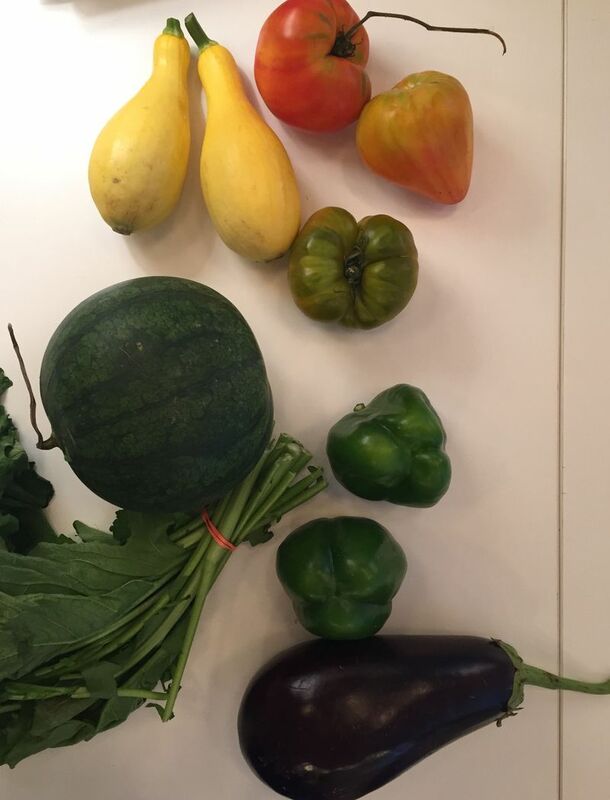 This week, our Local Roots CSA delivery looked like the rainbow. We were so jazzed by the delivery, we challenged ourselves: Can we make one dish with every part of the rainbow? We started with Amanda's Watermelon Tomato Salad with Cumin and Fennel, a recipe we've been eyeing all summer. But we didn't make the dressing with watermelon juice, because our melon was tiny and we wanted to eat every bite. We mandolined the green bell peppers and the raw squash into thin slivers. While we were a little unsure about raw summer squash, Seamus Mullen gave us confidence. We threw in some feta we had, along with some pea shoots that have held up surprisingly well since a video shoot a couple weeks ago. The eggplant and mustard greens are still hanging out. Any ideas what we should do with them? I like grilled eggplant myself. Just slice, olive oil, salt, pepper. It keeps well in the refrigerator, will freeze, and makes a handy sandwich addition. The mustard greens would get sauteed with minimal fussiness. Again, salt and pepper either in olive oil or butter. Possibly a touch of garlic and/or lemon juice. The better quality the produce, the less I manipulate. Just enjoy it for what it is.